On-demand queries are charged based on the number of bytes read. For current on-demand query pricing, see the Pricing page. When you enter a query in the GCP Console, the query validator verifies the query syntax and provides an estimate of the number of bytes read. You can use this estimate to calculate query cost in the Pricing Calculator. If your query processes a small amount of data, you might need to convert the bytes that are processed from KB to MB. MB is the smallest measure that is used by the Pricing Calculator. When you enter a query in the GCP Console or the classic BigQuery web UI, the query validator verifies the query syntax and provides an estimate of the number of bytes read. You can use this estimate to calculate query cost in the Pricing Calculator. When you run the command, the response contains the estimated bytes read: Query successfully validated. Assuming the tables are not modified, running this query will process 10918 bytes of data. If your query processes a small amount of data, you might need to convert the bytes that are processed from KB to MB. MB is the smallest measure used by the Pricing Calculator. 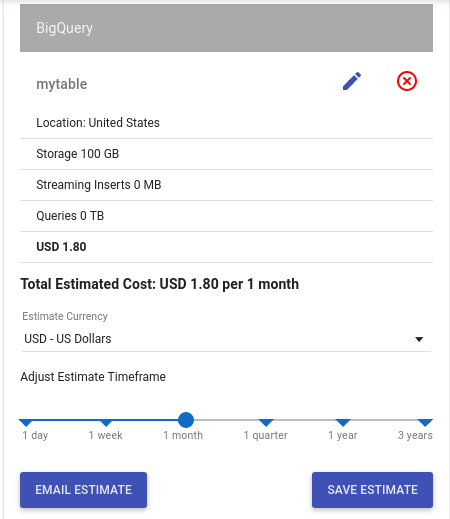 To estimate on-demand query costs in the Google Cloud Platform Pricing Calculator, enter the number of bytes that are processed by the query as MB, GB, TB, or PB. 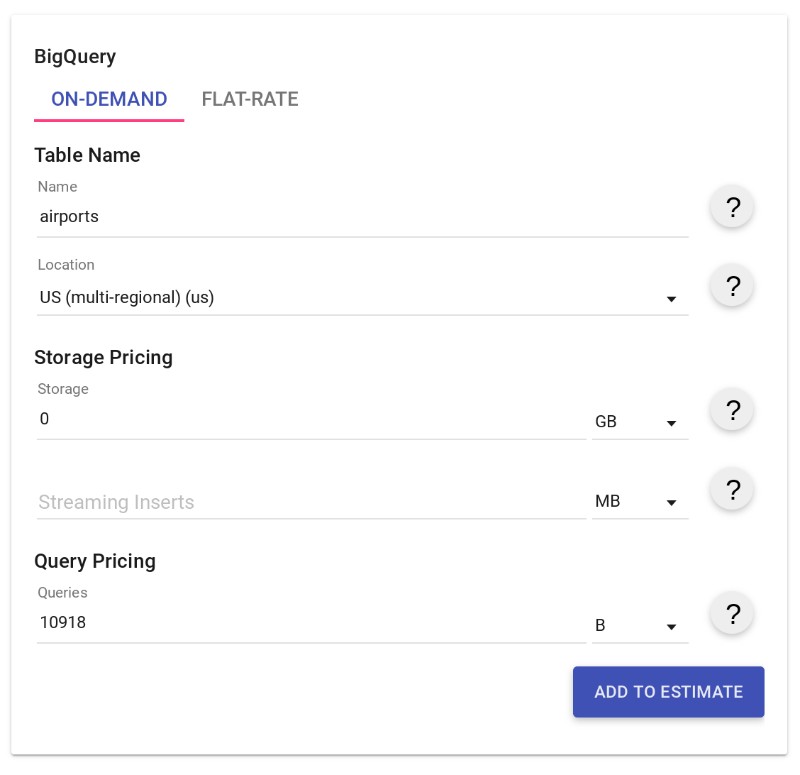 If your query processes less than 1 TB, the estimate is $0 because BigQuery provides 1 TB of on-demand query processing free per month. For Table Name, type the name of the table. For example, airports. For Storage Pricing, enter 0 in the Storage field. For Query Pricing, enter the estimated bytes read from your dry run or the query validator. If the value is less than 1 MB, you must convert it to MB for the pricing calculator. Using 10918 bytes as an example, the value is approximately 0.01091 MB. The estimate appears to the right. Notice that you can save or email the estimate. In this case, the number of bytes read by the query is below the 1 TB of on-demand processing provided via the free tier. As a result, the estimated cost is $0. If you have flat-rate pricing applied to your billing account, you can click the Flat-Rate tab, choose your flat-rate plan, and add your storage costs to the estimate. 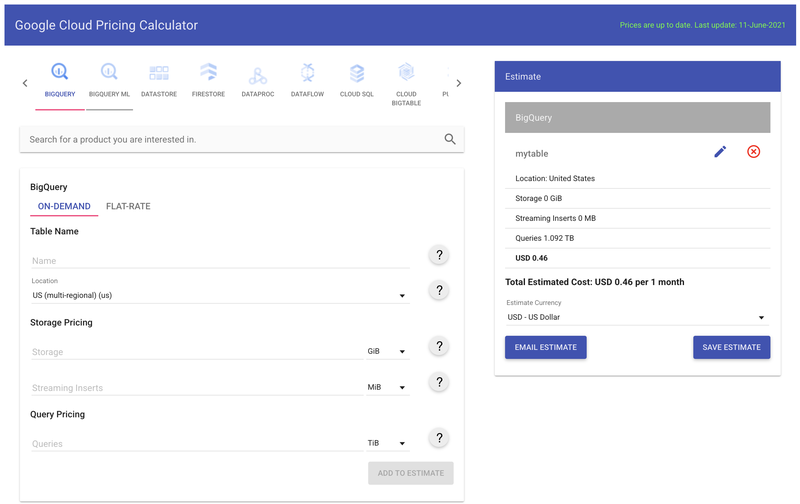 To estimate storage costs in the Google Cloud Platform Pricing Calculator, enter the number of bytes that are stored as MB, GB, TB, or PB. 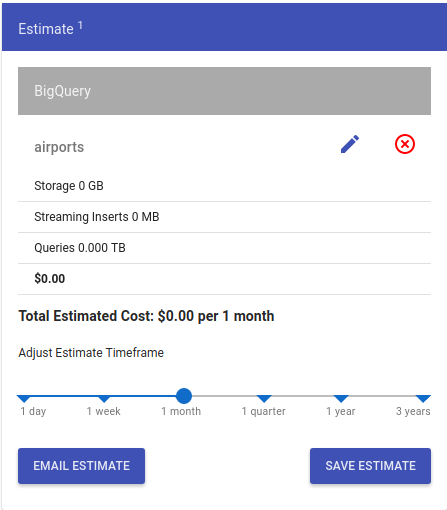 BigQuery provides 10 GB of storage free per month. For Storage Pricing, enter 100 in the Storage field. Leave the measure set to GB. Note: Currently, the pricing calculator does not include the storage free tier. You are provided 10 GB of free storage per month.